Few would deny Scotland faces a housing crisis which inflicts real hardship on hundreds of thousands of families every day. With 200,000 people on the housing waiting list, it will take them 20 years, at the current rate, to secure decent accommodation – since fewer than 1,000 new homes were built for rent in the public sector last year. With the average price of a house now £200,000, it is well out of reach of most people – at eight times the average wage. Meanwhile, the average rent in the private sector is £650/month – and that gets you little more than a small flat. Scotland’s housing system is clearly broken. I believe the housing crisis is now one of the most urgent problems facing us. So, the Scottish Socialist Voice – the country’s only socialist newspaper edited, printed and published in Scotland – is to be congratulated for organising this weekend’s discussion on how to solve this apparently intractable problem. Joining me on the platform will be Aisling Hedderman, Chair of the North Dublin Bay Housing Crisis Committee and Stephen Wishart from Shelter. 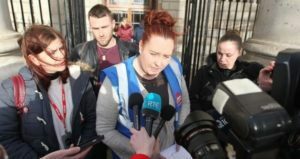 Aisling is active in the fight against housing poverty in Ireland and she has been involved in reclaiming several properties in Dublin left empty after Ireland’s last housing collapse. 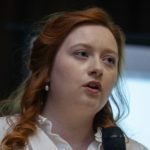 She has led direct action on the issue and will relate her experiences in building a grassroots movement seeking solutions to Dublin’s appalling housing shortage. The Scottish Socialist Party advocates similar action here. Stephen will relate his experience working with families on the homeless front line. His charity provides more than a million people with advice and housing support services annually in Scotland. I know the scale of the housing problem here in Scotland and I’ll be outlining the Scottish Socialist Party’s solution to the crisis. The SSP rejects the view, prevalent for the past 30 years it seems, that the “market knows best”. All the available evidence shows that not to be the case. The belief that only the moneyed few can enjoy a decent home – while the rest of us are denied our inalienable right to affordable accommodation equipped with all the amenities and facilities we should expect in the 21st century – is one the SSP rejects. And yet it increasingly seems the SSP are one of the few voices left championing such an opinion. And more broadly the SSP takes the view that in housing as in other areas of former public services such as energy and railways there is also a compelling need to break the 30-year spell of neoliberal “market knows best” economic policy. This belief that the world is run for the benefit of the rich few with the rest of us left to suffer the spiral of declining services and soaring bills is widespread and yet stands as a rebuke to all Scotland’s major parties who fail to challenge it. It is this attitude that underpins our firm belief that only a major change in how economic policy is implemented in order to check and then reverse the dominance of big money over all our lives. No one should expect those parties advocating neo-liberal free market options to solve Scotland’s chronic housing crisis. Not only are they not going to solve the problem they are complicit in it, supporting an ideology that insists home ownership must be used to stoke up the illusion that all of us can share in free market capitalism with an ever-appreciating housing ‘asset’. The Socialist Voice Forum will take place on Saturday in the Glasgow UNISON office in Bell Street. And that is appropriate since UNISON opposed the selling off council housing and backs the case for a large-scale programme to build new public housing. For the SSP the solution is surely to begin a massive house building programme, like we did in the past, this time providing 100,000 new houses for rent in the public sector over the next 5 years. This proposal reminds many of the approach taken in Glasgow and elsewhere in the 1930’s and 1940’s when the Labour authorities was pressed by activists and tenants to combat an earlier housing crisis, one which drew unwanted worldwide attention to the city’s appalling slum housing conditions back then. 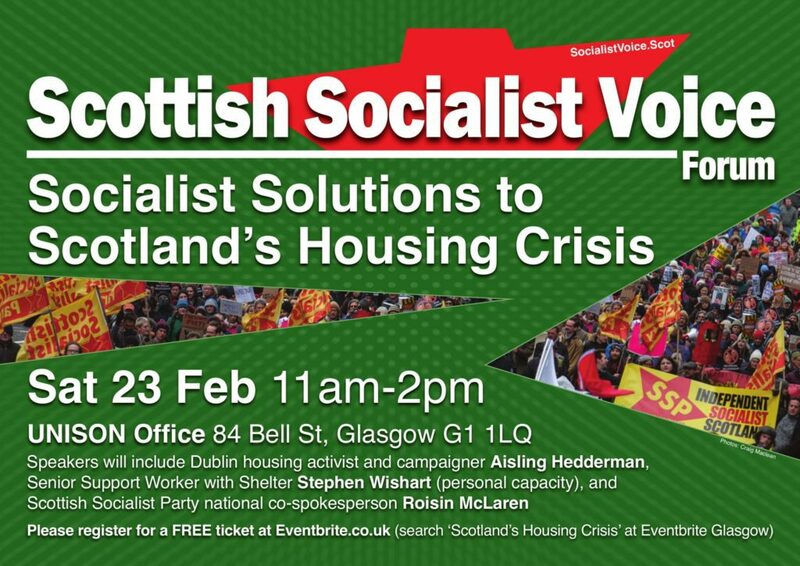 This weekend’s Scottish Socialist Voice Forum aims to offer up solutions to this chronic problem and to mobilise people, young and old, to act on the immediate housing challenges and contribute to a longer-term vision of an independent Scotland aiming to put the needs of tenants before the profits of the few. The post Why have Scotland’s politicians failed to solve our chronic housing crisis? appeared first on Scottish Socialist Party.